It’s late October, and a southeast gale is tearing up the Atlantic seaboard. The lighthouse looks like an old clipper ship rounding Cape Horn in a big blow, and the dozen anglers dressed in waders and rain gear are the waterlogged sailors working the deck. I take a spot along the picket line closest to the point. The gusts are strong enough to buckle your knees. 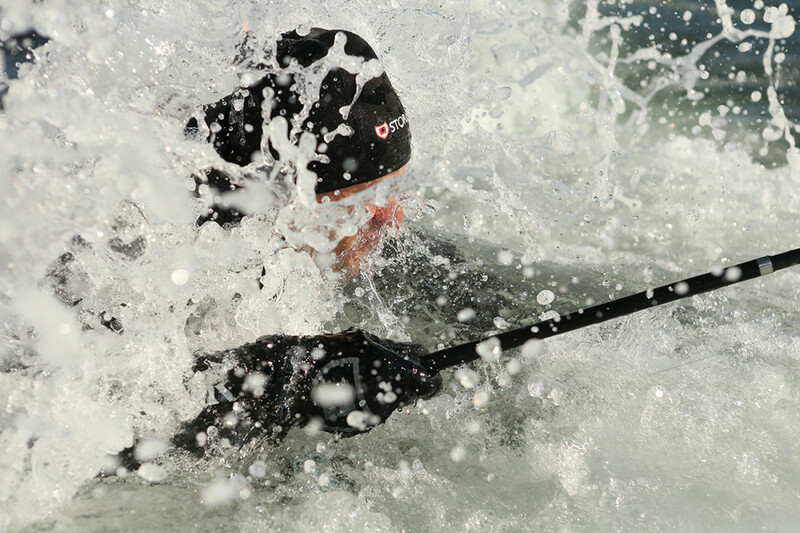 Spray pelts me, and every now and then a wave races up the rip-rap wall and threatens to sweep the legs out from beneath all the men in the row. You see a big one coming and brace for the impact. Thick, gray swells roll out of the rain and mist. When they hit the reef, they transform into towering 12-foot wedges with white tops and flat-colored faces. Some roll down the channel to the northwest, but others reflect off the shallows and swarm the point like a furious mob. Huge plumes of water shoot skyward as if a small depth charge has been detonated. High tide is still more than an hour away, and one fisherman predicts the northwest corner of the seawall will be demolished by the time the storm is over. I doubt it, but you can see how the lashing gale could give that impression. The storm is exhilarating, and the bluefish feeding off the north side of the light are as happy as clams. I fish a heavy tin squid on an old 12-foot Lamiglas surf rod, and when I set up on a big blue it’s as if I’ve hooked a small undersea tempest spun off from the maelstrom above. 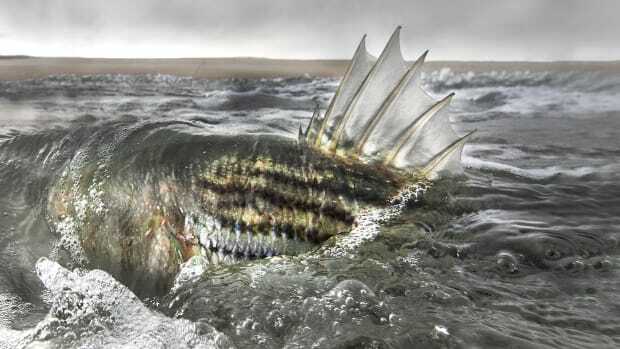 A striped bass is led into the shallows. 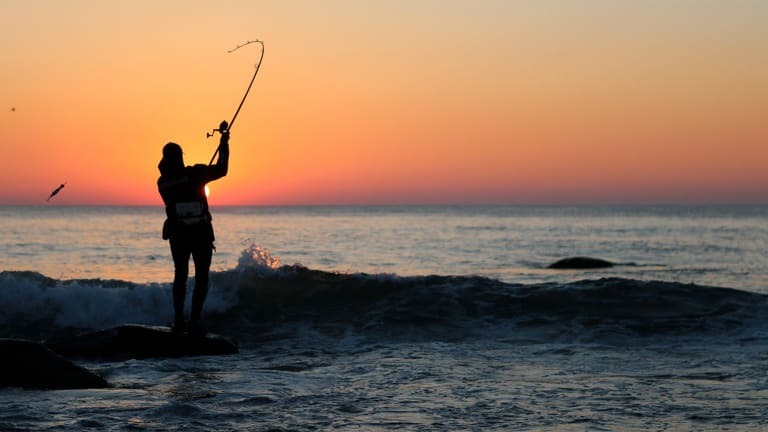 Surf fishing binds you to the landscape. I sit on a beach log in early October and listen to a conversation that the southwest breeze is having with the young flood. The small swells answer, and the terns carry the tune a little further with their dips and dives and cries. It is nearing 5 p.m., and things are looking fishy. The fall light is special. It has a tangible quality that you can touch and feel. A bass or false albacore never looks more golden or green or black or silvery than when dripping wet, gleaming with this light. A windy glow sweeps over the bluffs, beach grass and surf, and your small corner of the world catches its breath and comes alive. It’s as if you whispered abracadabra. All the players, from the breeze and tide to predators and prey, are held together like atoms in a chemical bond — there may be no way to break it, nor any reason to. Some years, fall comes slowly. It is mid-September — technically still summer, but fish are on the move — and I help the old gaffer into the water for his first swim of the season. He is pushing 90, his legs are a bit wobbly, and his fishing days are long behind him. But he gives me fishing reports whenever we talk. “Maybe this is what I need to make my legs feel better,” he says. We wade out slowly, and I watch the terns working over bait about three casts off the beach. 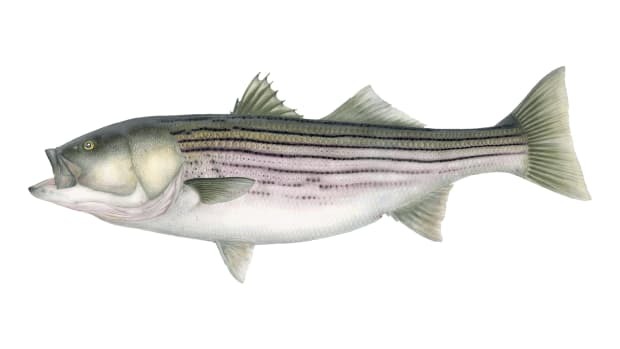 The fall migration produces moments of lovely mayhem: Panicked bait flees as stripers sweep through the surf line. I remember the year that summer left on a September nor’easter. Fall swept in behind it like a raptor, with its clear, penetrating light, north wind and boundless night skies. That storm kicked off the migration, and suddenly everything was on the move. Bass, blues, albies and bait, wind birds and hawks, monarchs and men with fishing rods. We are wind-up toys gone haywire. The long summer turns the key that coils our little springs until they can be wound no tighter. With each succeeding week, the angle of the sun’s rays grows more oblique. Soon the key is released, the springs unwind, and all creatures ruled by the season begin running hither and fro. I am fishing a rock pile at the end of a barrier beach. A large school of juvenile bunker surfaces a couple of hundred yards beyond me. 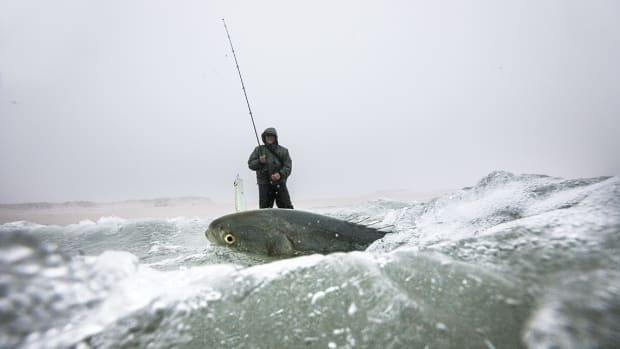 The action begins slowly, with nervous bait ripping the surface like a corrugated washboard. 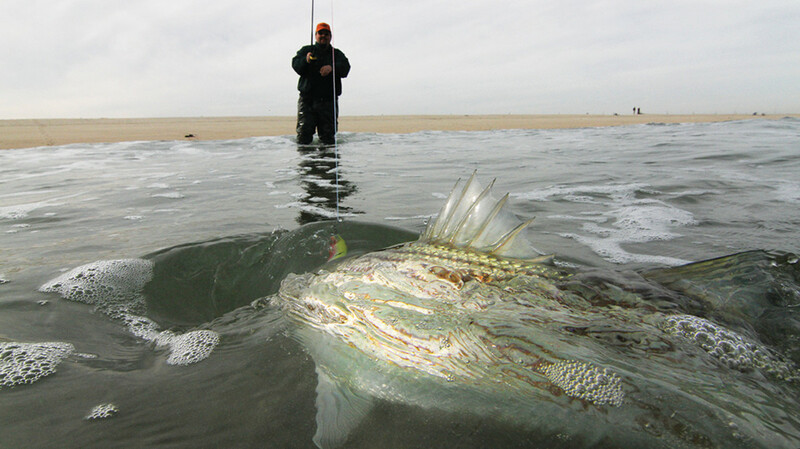 Within a few moments, the entire shimmering mass moves shoreward, herded and driven by ravenous striped bass. They cover the distance in two minutes, maybe less, moving from water that is 40 feet deep to the shallows. Suddenly, bass and peanut bunker are literally at my feet, just a few rod lengths away. Scores of small silver fish that took to the air to escape being eaten flap helplessly on the wrack weed covering partially submerged rocks; the sun reflects off their tiny scales. 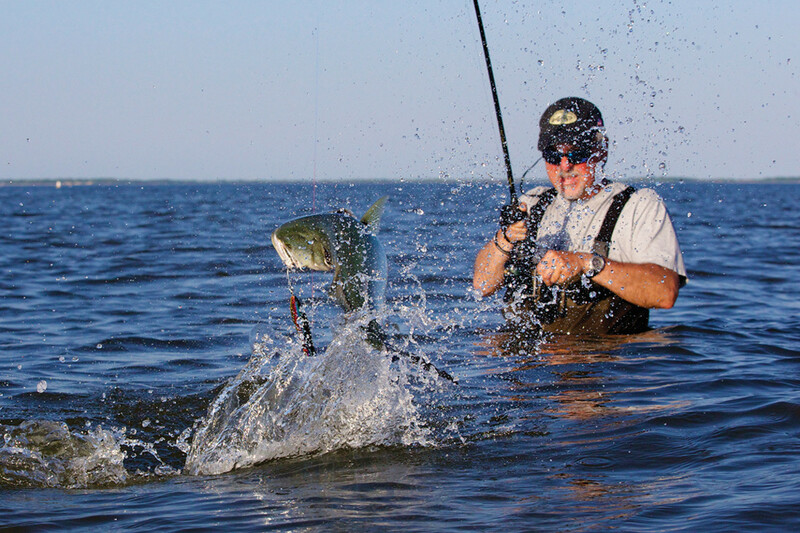 The siren’s song of fall is the slurping, popping and slapping of cartwheeling bass and panicked prey. 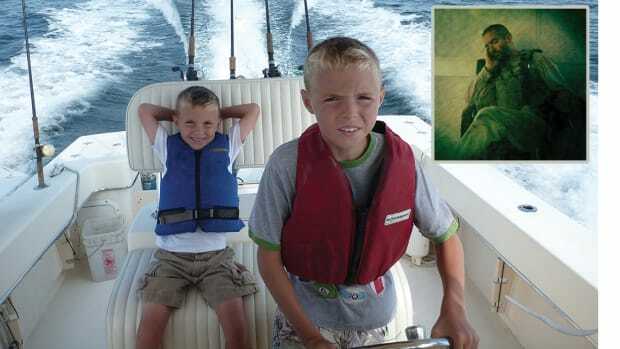 Bent rods are everywhere — in the armada of small boats squeezing in as tight as they dare, in the hands of fellow rock-hoppers standing to my left and right. I fish a white leadhead jig with a soft tail, and it’s fish after fish. The hard part is working the jig beneath the blanket of bait to the bass. 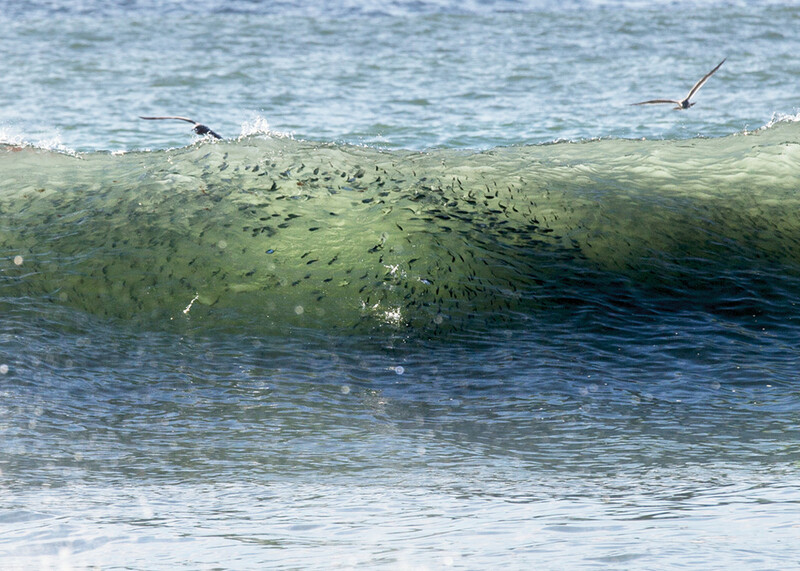 Your notion of surf fishing changes the first time you find yourself in the midst of this lovely mayhem. It’s one of those scenes that becomes permanently imprinted on your cerebral cortex, dragging you back to the water’s edge year after year, searching for a new episode. Fall is a hungry season. A bluefish explodes into the air. I love a windy beach at night, late in the season, with just a little moon, the light reflecting off the pools and the damp hard-packed sand. The wind builds as the cold front shoulders its way in. Twilight is magic. In the low, orange light, I spot Tim on his rock. As I approach, he sets up twice on a fish, hard. I watch him fight the bass as the light drains into the sea. It’s a decent fish. 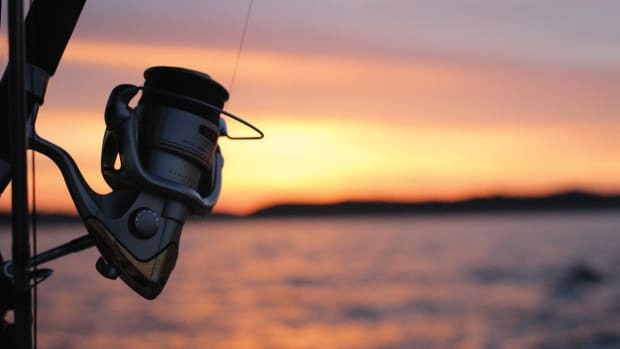 He hefts it in the gloaming, holds it out as if to admire it and tosses it back into the wash.
“Lot of fish been caught from this rock,” I say. “If I had a dollar for every one,” he replies. I climb aboard the big rock, and we chat and catch a few small fish as the moon breaks the horizon. A little companionship between two people who really don’t need it. 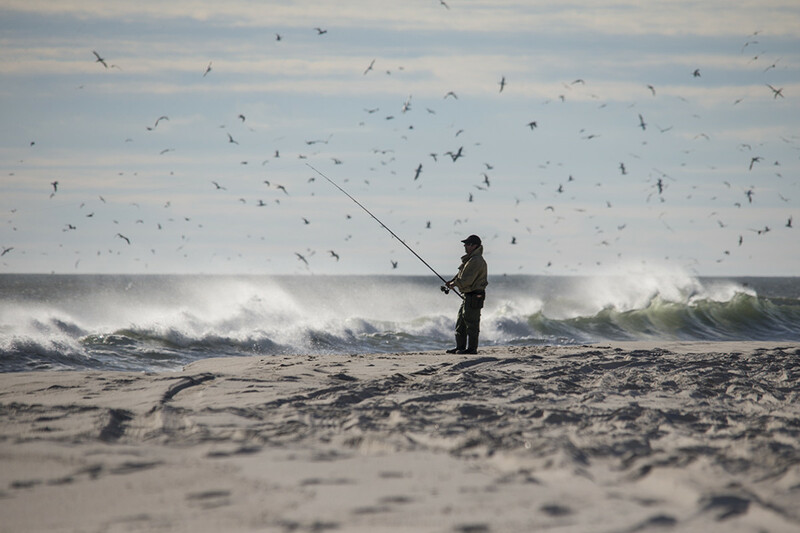 There is more than a touch of the frontier spirit in those who fish from the surf and chase striped bass at night. 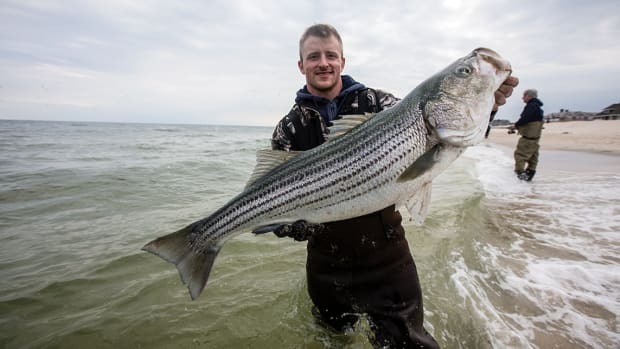 It is a fish and a pursuit that rewards what author Wallace Stegner called the “mongrel smartness” of Huckleberry Finn, a native intelligence gained not through books or YouTube videos but through experience, by doing and seeing firsthand. 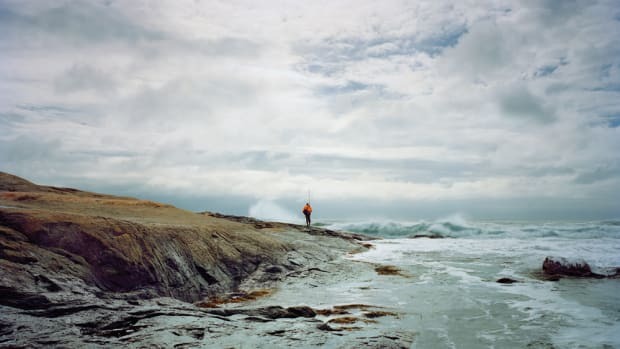 I learned to read and work the surf from a rocky point where a group of hard-nosed fishermen set the tone and established the rules and pecking order, all unwritten but very clear. As a boy, you put in your time, paid your dues and earned your spot in the picket line. They were mostly hard-working tradesmen: carpenters, pipe fitters, mill rats, welders, plumbers, electricians. Salt of the earth, my mother would say. They squawked like black-crowned night herons, but they took me under their coarse wings. At their elbow I learned to work a swimming plug, gaff a fish, cast straight as string with men tight on both shoulders and swear like a sailor. 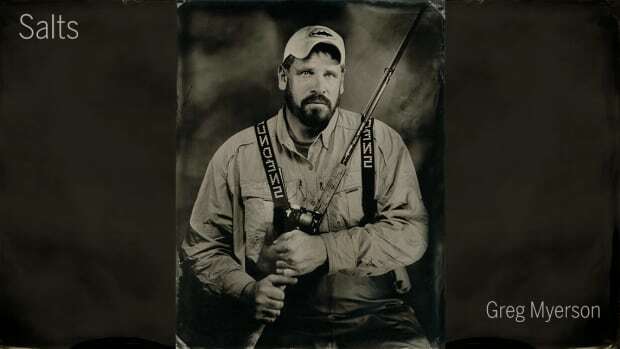 They were a rough-talking bunch, and I’ve never lost my fondness for stringing together long processions of invectives, especially when the fishing is good and the endorphins are racing every which way. 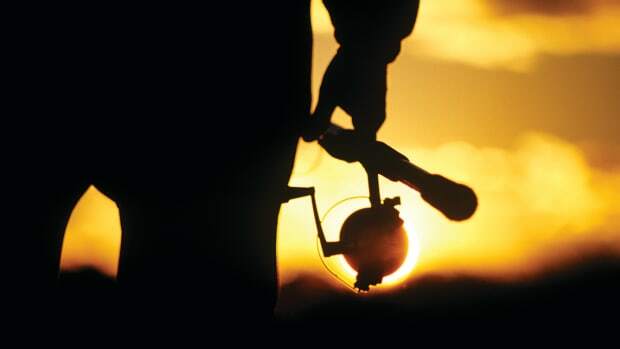 You fish late into the night because it’s how you and the rest of the tribe are wired. On this night in early fall, you stay later than the fish call for. The larger bass skedaddled with the last of the tide, nearly two hours ago. You stay because the season is turning over and you are on the cusp of it, and the moon is pretty, and it’s unseasonably warm, and there are still enough small fish to bat your plug around and keep you interested. You stay because there is no one to spoil it with noise or lights or sloppy fishing; and even if your companions were buttoned up, it’s sometimes better alone. You stay because you are on a good flat rock, and you are alone with your thoughts, and all the sounds and lights are familiar friends. The cry from a startled shore bird, the fog signal from the spark-plug lighthouse off your right shoulder, the familiar flash sequence from the granite light tower to the east, warning of reefs and, for the imprudent, woe. You stay because, as Thomas Merton said: To really know a place, you have to experience all its moods. You stay because you are home. The sounds of gulls, surf and wind fill your ears. You gladly put in your time waiting for a strike, the rod to bow and the mechanical voice of the drag to sing out. Tonight the beach is steep, windy and lonesome. Dusk slopes right into night. There’s nothing slow or gentle about it. “Lights out,” shouts the warden. When I was younger, the bleakness and fatigue worked to unsettle me. Now I relish it. Gone is the “ripe sun-warmed smell” of summer pears (Joyce Carol Oates’ description), replaced by the pungent smell of decay in salt marshes, wrack lines and tidal rivers. Everything that can burrow into the mud, move to deeper water or migrate to more temperate climes does so as fall moves to its last quarter. You shoulder on, fishing for stragglers. It helps to have a bit of sand, a pinch of “downright cussedness” in your makeup, to quote my late Swamp Yankee nana. Snow squalls rain down in the late afternoon. Big flakes fly horizontally like soot or ash or insects on the north wind. It is the third day of gales, and it’s safe to say the season is shutting down. There is an emptiness and foreboding that comes late in the fall, when you are tired and the sky presses down, and the shorebirds are fleeing south in low, broken strings, and the fish are hard to find. It is lovely and lonely. and the air of these days is charged with their pain. The cold, penetrating light of November changes so rapidly, fading right before your eyes. One moment you’re casting into shadows, the next darkness. The fish have become memories, and still you hunt for one more. Where has everyone gone? What happened to the beach fires, the laughter from lovers hidden behind dunes? Where are the trucks in the lot? Every last boat in the harbor has been hauled, the mooring balls replaced by winter sticks. There is frost on the windshield and on the eel cooler, and the seaside town where I fish has hung holiday doodads from the light poles. You are cold, wet and alone. It is hard to feel anything but insignificant next to all this gray water, sand and stone. One fish will change all that. You stay for the chance at that one fish. Someone has to be the last to leave the beach. 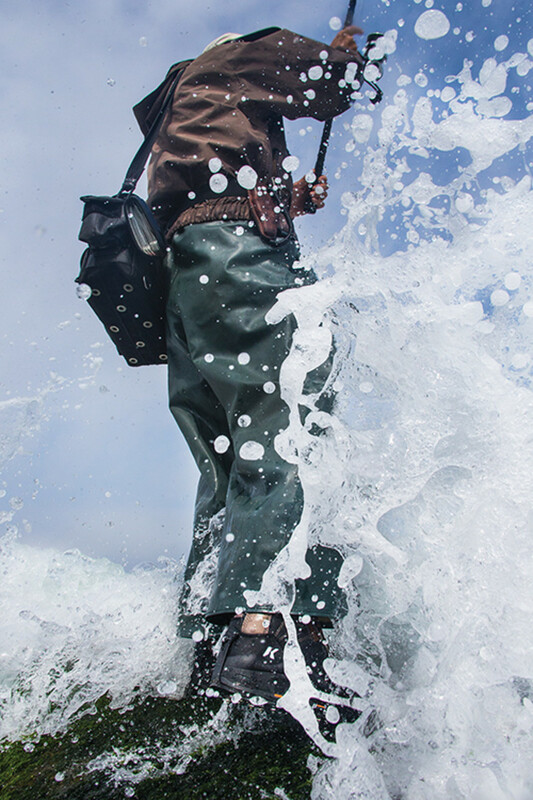 This is fall surf fishing, and you’d be crazy not to love it.